When Daniel was thrown in the lions den. The King and his croanies thought for sure Daniel would be eaten by the lions. Little did they know, that God had his hands on Daniel. God knew what was in Daniels heart. He knew that Daniel spoke good of God and of the common person. Daniel stood for truth. He would not bend. The point to be made is this. Never compromise your belief in God ever. Daniel 6:22-24 "My God sent his angel, and he shut the mouths of the lions. They have not hurt me, because I was found innocent in his sight. Nor have I ever done any wrong before you, O king. Scripture says the king was overjoyed. Daniel was brought out, unharmed, "...because he had trusted in his God." 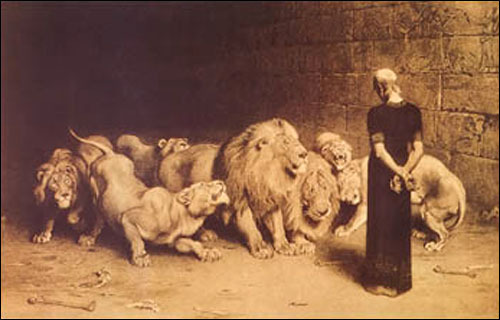 King Darius had the men arrested who falsely accused Daniel, and along with their wives and children, they were all thrown into the lions' den, where they were immediately killed by the beasts. Then the king issued another decree, ordering the people to fear and reverence the God of Daniel. Daniel prospered under the reign of Darius and King Cyrus the Persian after him.